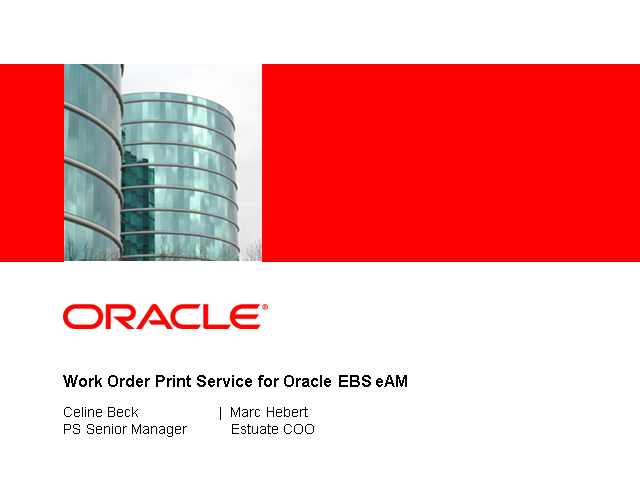 Estuate’s Work Order Print Service solution for Oracle EBS eAM customers is powered by Oracle’s AutoVue Document Print Service, and can transform an organization’s maintenance operations. This joint solution enables Operations & Maintenance personnel to easily create and print complete work order packets, including all related attachments; such as safety documents, maintenance manuals and/or equipment diagrams, which improves the productivity of O&M personnel and eliminates risks associated with manually assembling work order packets. AutoVue 20.1 is the latest major release of the family of Enterprise Visualization solutions from Oracle. Significant R&D investment in 20.1 reinforces AutoVue’s enterprise class architecture and delivers a visualization platform capable of addressing all document visualization needs within an organization, from personal productivity for desktop users to enterprise wide visualization and collaboration. AutoVue 20.1 also includes: a series of powerful integration enablement capabilities, which partners and systems integrators can leverage to develop differentiated solutions; industry specific enhancements for high tech and asset intensive customers; unparalleled new format support, as well as significant improvements for cost-effective AutoVue deployment and administration. Don’t miss this opportunity to discover how your organization can take advantage of this latest release. Enable Engineering Information Management in a Post Deepwater Horizon World. In response to the Deepwater Horizon incident, it seems regulators are set to introduce a wealth of new controls that will change the way engineers and maintenance operators need to access and track engineering and asset documents and information. Organisations will have to ensure that everyone can view the latest versions of asset drawings, engineering plans or local plant specifications, and produce accurate records of their construction, maintenance and repair activities for improved safety and decision making. Join this Webcast to learn how you can improve your engineering information management processes. AutoVue solutions are designed to view, annotate and collaborate on a variety of engineering, product and asset documents and information, without requiring investment in specialized CAD or authoring tools. AutoVue's digital annotations capture comments and feedback within the appropriate context, providing an audit trail of changes and approvals. AutoVue can be integrated into existing content management, PLM or enterprise applications, allowing users to leverage AutoVue into their existing and evolving IT infrastructures. Watch this Webcast and learn more about AutoVue key capabilities and how they can provide real world benefits for engineering, asset and product intensive organizations. A successful ePermitting strategy provides all stakeholders with access to the digital assets they need in order to have permits properly submitted, reviewed and approved. Adhering to legislative processes and requirements, while providing a secure and reliable collaborative environment to system users, is paramount to achieving your objectives. Architecting the solution requires solid integration points from the front end workflow all the way through to the back-end repositories. Attend this customer roundtable and learn how customers are driving innovation of their ePermitting programs with powerful visualization and collaboration tools. Join us and learn how to maximize your IT investment, accelerate your ePermitting process, and deliver citizen services more cost effectively. This is the age of digital assets. Thousands of global companies are creating, editing, and managing millions of digital files every day. These important assets are created by different departments or geographically dispersed teams using an assortment of applications and are housed in a variety of enterprise systems. Unfortunately, the siloed and disconnected nature of these systems prevents information from flowing freely among them. This locks valuable data in a given system, greatly impacting an organization's productivity, collaboration, and profitability. Integration into key business systems and best of breed solutions such as SAP, Oracle, Primavera, Opentext, Documentum, Microsoft SharePoint and others allows companies to expose, use and enrich visual context into ECM, PLM, PPM, ALM and others…supporting visual decision making and operational excellence. Join us and learn how to maximize your SAP investment, accelerate your business processes, and deliver visual decision making to the wider SAP community. Live & Recorded Webcasts, Product Demos and Tutorials. Oracle AutoVue enterprise visualization brings products to market faster, enables better business decision-making, and increases revenue and profitability by meeting all of an organization's document visualization requirements. To ensure our customers have access to the best and brightest information on key industry topics, we are delivering presentations from Industry and Product Experts, Existing Customers, and Thought Leaders. Complimenting the presentation calendar is an ongoing set of Product Demos and Self-Service Tutorials delivered by Oracle Product Experts. The Oracle AutoVue Channel is the home of Document Visualization.